The pendant necklace with natural agate beads, alloy accessories and hand-knotted cotton thread is handmade jewelry for unisex. This gemstone strand necklace is also a yoga necklace. When doing yoga, it helps the wearer promote self-awareness and allow healthy self-expression. The wearer can also wear it as a wrap bracelet for keeping balancing. It is also a good idea to hang the long Y-shaped agate jewelry around your car or house when you meditate on it. PERNNLA PEARL is dedicated to providing a large selection of the latest fashion trends and to maintain comfortable shopping experience for our customers. We have a broad range of fashion jewelry, which includes bracelets, necklaces, and earrings. We have a wide selection of designs to fit your taste of trends. The handmade agate necklace is designed for men and women. It is made of round black agate beads, natural red agate stones, alloy accessories and Japanese cotton thread. This long beaded necklace consists of 2 parts: the "V" part and the pendant. The length of the "V" part is about 39.5 inch. And the pendant measures around 3.9 inch. 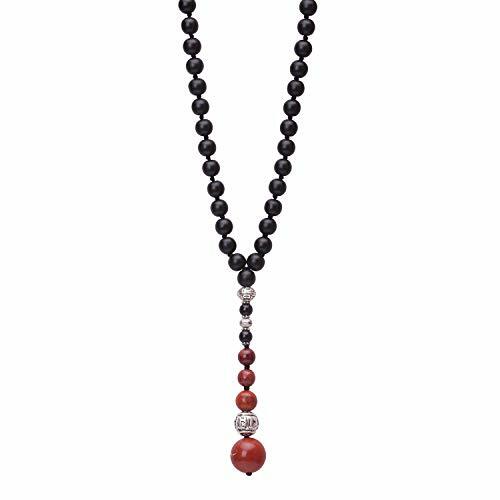 8 mm black agate and 8 mm, 10 mm, 16 mm red agate are adopted to make this mala beads necklace. We imitate the practice of 108 agate beads - a symbol of the removal of 108 kinds of trouble. This knotted necklace is suitable for meditating. It symbolizes the wearer keep peace to increase relaxation in life. A detail of the prayer necklace is durable knots, which can prevent agate beads from rubbing. The cotton thread knots can also make sure the firmness of the agate pendant jewelry. It brings the better wearing experience of this Y-shaped jewelry. Fit both women and men of any age, this semi-precious necklace can be easily worn. It helps the wearer to be an eye-catching person. This healing necklace is a nice decoration for people on any occasion, such as daily life, summer vacation, party, Christmas, birthday. This mala necklace can also be a great present for the ones you love in order to express your best wishes. Agate is a kind of energy stone which represent tranquility and healing. It encourages physical, spiritual and emotional healing to the wearer. They achieve the purpose of protection for the wearer through rebuilding confidence and strengthening power. This women's gemstone necklace will be packed in a velvet bag first, then in a "PERNNLA" brand box, perfect for keeping safe. We also guarantee all agates are of high quality. If you meet any problem or need customized service, you can feel free to contact us. If you have any questions about this product by PERNNLA PEARL, contact us by completing and submitting the form below. If you are looking for a specif part number, please include it with your message.